It used to be when I visited a town or city I would seek out secondhand bookshops. 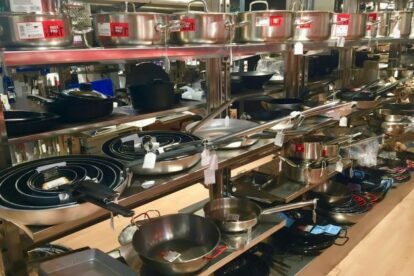 More recently I have begun to seek out cookware stores. I’m not alone — I know many visitors to Barcelona share the habit. My son is a sous chef — here, in Manchester. My sister works with a chef to prepare à la carte dinner parties to be served at home. I have a friend who owns three restaurants on Cape Cod. My partner has a collection of more than 60 books about food, and she regularly cooks a very tasty seafood paella and an exceptionally good osso bucco. I write about food and enjoy cooking. You can buy cookware online — however, to properly assess the quality of design and manufacture you need to have it in your hand and get a measure of its weight, feel and grip. Casa Gay, established in 1860, is one of the best cookware stores in the city. Whether you’re preparing a simple meal for one, a buffet for 200 plus diners, or serving party cocktails, Casa Gay has everything you may possibly need: cookware, tableware and glassware, industrial strength robots, mixers and blenders, and examples of every gadget you can think of. Staff from some of the city’s best known restaurants and hotels buy their equipment here. It’s not as expensive as you may think, in fact, they have a permanent sales section where you can buy, for example, a good quality whisky tumbler or ramekin for as little as 40 centimos.